Martha Berry writes to Charles Adamson urging him to write a letter to the newspaper clearing up the Berry Schools' financial situation. She thinks the publicity about the Ford Buildings had convinced people that the school no longer needed funding. This is a letter from Martha Berry to many of Berry's supporters. She asks that the reader donate money to the school, preferably $150 each, so that she can continue to accept boys and girls into the school. This is a letter to Miss Berry from Wm. P. Waterhouse. Waterhouse explains how things are better in the year so some money is enclosed to Miss Berry for the Berry Schools. 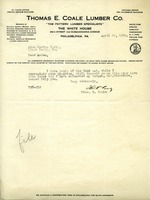 Letter to Mrs. Bruce Ford from Martha Berry, asking if Mrs. Ford could invest $150 dollars to the school as a way to keep some of the students in classes for a year. 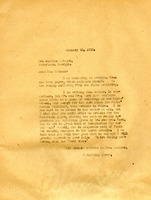 A letter from Thomas Coale explaining to Martha Berry that he is unable to fund the Berry Schools at the moment due to an exhausted budget.